In this episode of All Things Marcellus, Attorney Doug Clark of The Clark Law Firm discusses how oil and gas lease agreements are presented to Pennsylvania property owners. Doug explains the gas company’s present a standard form oil and gas lease usually consisting of two to four pages. These gas lease form documents are drafted by smart company lawyers for the benefit of the gas company and not the lessor. These gas lease agreements have evolved over time and are carefully designed to take advantage of Pennsylvania oil and gas law to the benefit of the company and not the royalty owner. The landowner or natural gas right owner must negotiate to have beneficial terms added to the gas lease by way of an attached Addendum. Often gas companies will have their landman present gas lease agreements with addendum terms already provided. These company provided addendum terms must be highly scrutinized because there is a strong chance that these terms initially offered by the company provide little to no protection or benefit to the landowner/lessor. In this episode of All Things Marcellus, Attorney Doug Clark dives deep into how there is no special or fiduciary relationship between oil and gas companies in Pennsylvania landowners and oil and natural gas right owners. Far too often natural gas and pipeline company landmen use a common selling technique by stating that the natural gas right owner or property owner and the energy company are in a “partnership“. This is simply not true. The property owner and oil and gas right owner are not in a “partnership” with the company when they are engaged in oil and gas lease or pipeline agreement negotiations. In this episode of All Things Marcellus, Attorney Doug Clark of the Clark Law Firm, PC breaks down specific oil and gas lease terms and explains how gas lease documents are carefully drafted to provide the company maximum operational flexibility and operational rights often to the detriment of the property owner. In this episode of All Things Marcellus, Attorney Doug Clark discusses oil and gas lease negotiations and pipeline negotiations and why landowners must stop simply signing contracts presented by the company landman. Property owners and natural gas right owners must effectively negotiate for higher compensation and to limit the authority provided to the company under the agreement. Landowners are often signing oil and gas leases or pipeline agreements presented by the company landman without understanding their negotiation leverage. Many times property owners can negotiate for tens of thousands or hundreds of thousands of additional dollars as payment for the proposed natural gas agreement. In virtually all cases, the property owner can negotiate a pipeline right-of-way agreement to limit the authority that they are granting to the company under the document. In this episode of All Things Marcellus, Doug discusses The Clark Law Firm’s representation of oil and gas right owners and property owners in Pennsylvania regarding natural gas issues. Attorney Clark explains how he has never represented gas for pipeline companies and how he works and fights for Pennsylvania residents and gas right owners. Doug goes on a bit of a rant about techniques that the gas and pipeline company landman use in an effort to induce or persuade Pennsylvania property owners to sign bad oil and gas agreements. Doug explains that companies love when large acre property owners or property owners with lawyers sign bad gas agreements. The company then seeks to use the bad agreements and present them to other property owners and explain that the person who signed this agreement had an attorney and you should just simply sign the same agreement and save money by not hiring an attorney. Doug explains that what your neighbor does, or anybody else in your area does, is not necessarily relevant to your case when you were negotiating to maximize money and addendum language in your unique situation. Of course, if there is a higher per acre or per foot rate paid in your area, we want that to be the floor for your compensation and your payment must equal or exceed the amount received by others in your area. However, at no point do we rely solely on what anyone else may have done, because they may have signed a terrible natural gas or pipeline agreement and their lawyer may have been experienced and had little knowledge of Pennsylvania oil and gas law or experience in negotiating complex natural gas contracts. Do not be fooled by a landman working for the company, get your own experience oil and gas lawyer and do not sign anything without consulting and knowledgeable attorney. 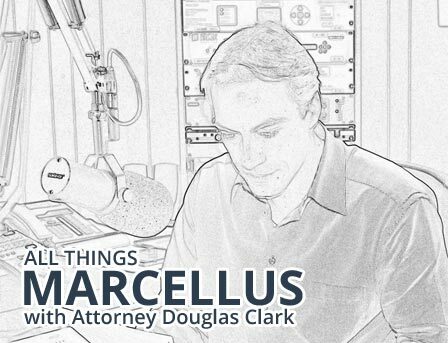 In this episode of All Things Marcellus, Attorney Doug Clark discusses oil and gas legal representation areas and how he represent his Pennsylvania clients in all matters related to oil and gas law. Doug discusses how he is doing more legal work representing land owners in breach of contract claims and other causes of actions against oil and gas companies. Doug explains why every time a land owner is presented a document they should see this as a potential opportunity. Property owners and royalty owners must make the most of all opportunities and negotiate all contracts and fight for the highest financial compensation and the most powerful addendum terms that can be added to the agreement to benefit the Lessor/property owner. Remember, quantity of contract addendum terms is not the test, but the quality of the added addendum terms are what matters. In this episode of All Things Marcellus, Attorney Clark starts the segment off with discussing why landowners must not sign oil and gas leases, pipeline, or other documents presented by the company without obtaining a legal review by an oil and gas lawyer. Gas lease and pipeline agreement amendments and changes to pipeline route maps can present great opportunities for the landowner for additional compensation and possibly to alter the original document that was not in their favor.